what my non-essential spending was. Non-essential spending is often the key to paying off debt. It's that money we all spend on magazines, coffee, movies, a packet of chocolate biscuits, iTunes, takeaway food, convenience food, soft drinks/soda and bottles of water. Most of us know that spending on these things is wasted money, but we still do it, "just this time". If you can identify the money you spend on those non-essential things and add up the money spent over a month, I'm sure you'll be surprised. And if you can harness that money and put it towards debt repayment, or even to buy the groceries you need this month, then it's a step in the right direction. Take a small notebook and pen with you and write it down as you spend. Collect every receipt and when you come home, add them up and record the totals. Use a smartphone app. The one for Australians on the government's Moneysmart website is very good. You can download it here. The data you enter into your phone can later be transferred to an Excel spreadsheet. It also allows you to set your limit and will track as you go and show you where you are in relation to your limit. You can download My Spending for Android phones here or Expense Tracker for iPhone and iPad here. Changing behaviours is rarely about the big things. The big ticket items stand out and we notice them. They make us stop and think before we buy. It's the small things that do the real damage. Usually they are items you want but don't need. We buy them because they're relatively cheap but when you track what you spend over a month and then add it up, you'll be surprised at just how much you spent on all those small things. When you get to the end of a month's tracking, you'll have a much clearer idea of what you're spending your money on. If you can stop that spending, your money can go towards your budgeting requirements. If you've never done this, it's worth doing. Otherwise you won't know your spending habits or how much all those small things are costing you. One thing is for sure, they cost you a lot more than you actually spend. When you have at least a month's tracking, you have the two figures you need to make up your budget: how much your income is and an accurate summary of your spending. Then you go to the next step. Working out a budget you can live with, while paying off debt in an organised way, or building your savings account. That, my friends, will be our next post. Please share your experience of tracking your spending and how you did it. Such an important thing to understand. The best book that helped me was All Your Worth by Elizabeth Warren and her daughter Amelia Tyagi. It really was clear and helpful. We've been saving receipts for a month or two, but it's not really been working, there are too many gaps. I didn't realise how many things we don't get a receipt for - our local corner shop, where we buy the odd pint of milk, bread etc doesn't give receipts. I suppose they would if we asked, I'd never really thought about it. Parking money, and if we have fish and chips occasionally from the shop we don't get a receipt. I'm going to sort out a little notebook and start writing it all down and see how that goes this month. I have never stuck to a budget nor tracked my spending but as things have changed in our home, this post has come at the right time, thank you Rhonda. App installed on my iPhone and lets see how I do! Your advice on tracking expenditure is invaluable to anyone trying to cut their spending. I've temporarily dropped to a four day week (to gain some extra time to focus on living simply) and so obviously my monthly salary has dropped as well. After paying bills, I'm determined not to reduce the amount I save each month and so will definitely be having to reduce my monthly personal expenditure. I'm keeping a daily log of my expenditure to track where I'm spending and how I can keep within budget. Hopefully it'll also help me change some of my less useful spending habits. Oh, that's what we have done ever since we got married (44 years ago). We have a budget book with headings for expenses----rent, elec,phone,clothes, gas, maintenance items etc., etc. Every receipt is kept and entered in the book by my husband (a now retired economics professor). At the end of the month it is all added up and subtracted from the money coming in so we know where we are. It is tedious (I get sooooo tired of pulling those receipts out of my purse after every shopping trip) but it does work and after awhile it gets to be a habit and so doesn't require remembering to do it----it just becomes the next step. You're in a lot better shape when you know exactly where you stand with reference to your income and outgo. Not only that it makes for fascinating reading as to how much we spent on food, gas, clothing etc. in 1969. it's hard to believe we got by on so little back then, especially if you don't adjust it for inflation. Tracking your spending seems so simple and obvious and every time I read/hear about it I vow to do it. However, I am a poor example an seem to fail in my efforts every time. July is a new month so I will have another go. Yesterday (July 1st) was a no-spend day - as are the majority of Monday-Fridays. What I do know, is that I have very little non-essential spending. Thanks for the reminder to keep track of what I am spending. I really will try this month. I'm loving your latest series of posts, they are getting me on track again and keeping me inspired. When I track spending I take a small notebook shopping with me, and then write everything down in a diary kept just for that purpose. In that diary I also enter bills that are due and note when they are paid. The diary is also where I note all of those miscellaneous things - $6 for school sport, $8 for school excursion etc...as they add up over time. Currently I don't track everything but I am saving all of my food-related dockets as food costs are rising and I want to know exactly how much we are spending - I have a feeling it's not the amount we budget for anymore. Yes I downloaded an iPhone app when I was trying to sort out our budget and my was it an eye opener! I would like to do it again now that we changed so much, but have been letting things slide a little while I'm doing extra paid work. It's the coffees that do it to me- sometimes I'm so exhausted I can barely spell my own name and I need that coffee to keep me going! I actually have a little thermos I take to work full of coffee but sometimes that is not enough! They add up so quickly! Rhonda, am enjoying these posts and I read through and think every time "that's sort of what we do"! I take a home brewed coffee to work in a travel mug in the morning and because I really don't like instant coffee (which is what work supplies) and I don't want to buy from the coffee van I keep a 1 cup plunger in my office and make my own brewed coffee. When our family was younger and we were budgeting strictly to pay off the mortgage, I ALWAYS shopped with a calculator so that I never went over my grocery allowance of $50. That is the best way to ensure you don't overspend in the supermarket. I always take my own lunch to work. I just cannot justify spending $50 a week on store bought lunches when I just cook up a bit extra for both hubby & I the night before. It's cheaper and always so much nicer too! Thank you for the mention in yesterday's post. Imagine my surprise when I opened your blog and read that at the top! I tried to leave a comment a few times but blogger was not being iPad friendly yesterday! Sandy, your comment came through yesterday, :- ) Thank you. Hello again. Several years ago my mum acquired a book something along the lines of the money tree and it encourages use of a envelope system. Very similar to what you described you and Hano follow. Last year I tracked my spending and watching my costs. One big thing was buying the kids small toy treats at the supermarket every few weeks and the other tuck shop every Friday. The toys got discarded after very few uses and tuck shop is quite frankly a luxury... I can buy the same things in the supermarket and it is usually half the price, my kids like the hot pies or the hot dog... So I give this to them at home after school now instead. Tuck shop was not a bargain at all... And did not teach them to spend their pocket money wisely. Another thing that stings is paying for parking if I don't plan ahead when visiting Brisbane city.... To go to discount clearance shops ... That backfired! The envelope/ziplock bag, notebook and fortnightly summary works well for me. hi Rhonda. I enjoy your blog and read often. We have just started using YNAB - budgeting software complete with app so you can record expenses while you are out. You can trial it for free to begin with, we are very happy with it. Linda. After the debt post and today's post on money I would love your thoughts on which paths we could follow with our current situation. Sometimes fresh eyes can see what we can't? We have paid off a lot of accumulated debt and cut our expenses right down. We still have one last debt of $12k credit card debit which we concentrating on currently. We have 15k in cash we have accumulated from selling a second car and a payment which we have been waiting to receive for a long time. By the end of the year we will have another 5k in cash from accumulation of payments and our tax. We are paying enormous rent which is 50% of my husbands wage. We would like to buy a home but the struggle to pay rent at the current rate and save for a deposit is near on impossible and we are now in our 40's. So do we use the cash and pay out the last remaining debt of 12k or do we save the money for a home deposit and continue to systematically pay off the debt and then add to our deposit?????? Pay off the debt - you will be paying a higher interest rate on the credit card than you will earn on your savings. My initial thought would be pay off the debt. But do you have an idea of what your mortgage repayments would be? It may well not be that much less than the rent you're paying, 15k is not a lot in terms of a house deposit these days, sadly. And I'm thinking in £sterling here too! Pay off the debt and save what you would have been paying on that, and more if you can it's a longer term plan, but probably better. You are so right, Rhonda, when you say it is the little things adding up that make the difference. It is so easy to just take a couple of dollars out of your purse to pay for the coffee, or the magazine. To see where my money was going, for a whole month I tracked every single cent I spent. 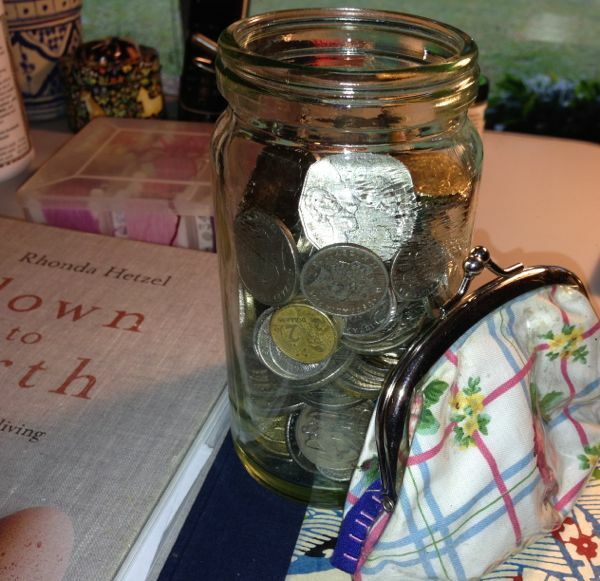 Each day, when I got home I'd get out my purse and count what money was in there, and reconcile it with what should have been there based on what I'd written down during the day. I didn't let myself get away with saying "it's only a couple of dollars, so it doesn't really matter". At the end of the month, looking at what I was spending money on was a real eye-opener. More and more of what people spend these days is done using a card - either credit or debit. In theory, that means it should be easier to track because you get the statement to check. But I've noticed that often it doesn't seem like "real" money you are spending, and also, because you don't look at the statement each day, you don't notice it. And have you noticed that many places now ask you if you want a receipt? I ALWAYS say "yes". How else can I reconcile what I've spent money on, or check that the credit card bill is correct? Just being mindful, rather than mindless, in spending, has worked for me. Hi Jacaranda. Well done for paying off a lot of your debt. I think there may be a few different opinions on this. I'd be a bit nervous if I was in my 40s and still renting. Even though you won't need a 20 year mortgage, that is what the bank will tell you you'll need, so you'll have to apply for that mortgage at least 20 years before you turn 65 or 67, the new retirement age (in a few years time). I'd pay off the credit card. If you keep it going, you'll end up paying more in interest. It looks like you have the means to pay it off today if you wanted to, and you'd have $3,000 left in the bank. Add the other$5,000 at the end of the year and you're well on your way to saving for a deposit. Do you know how much you'll need for your deposit? See if you can work that out, or ask at the real estate or bank, so you know what you're working towards. Are you working too? Would it be possible to live on only your husband's wage - 50% rent/50% all your other expenses? If that is possible, you could put your entire pay towards the deposit. Find out how much your deposit will be and work out how long it will take to save. Minus, of course, your $8,000 in hand. Good luck. Crikey, that's really tough. You're doing your best to help your children and the system lets you down. Will this new disability assistance scheme help you in any way? I've started using Mint.com to track things. I tend to pay with everything with a debit or credit card (and pay off the balance in full) because it makes it very easy to see where your money goes. My mum always adds in the "hit by a bus" clause - if you got hit by a bus tomorrow, would you feel you had missed out on things that you denied yourself? I apply this in our budget (a very tight one being a single income, stay at home parent family) by allocating a small amount of pocket money each fortnight - and there is no more....so the leash is a little less tight and you are still paying off the mortgage, meeting bills etc but in the mean time you aren't hating life because you miss going out and buying the odd cup of coffee. It's something that I've thought of doing but never get past the first week! But Mark is doing a holistic farm management course and it's a requirement for the course. so I have been a little better at it over the past month. We have just started tracking our spending. We don't have debt other than our mortgage but I feel guilty each month thinking that we should be saving some money or putting it on our mortgage. I'm pretty good at not wasting on little things like takeway, bottled water or magazines. I don't go shopping or spend much "cash" but what I have noticed is that I spend on the bigger things like an expensive item online for the home or something house related. I justify it because its for the home and I don't buy much for myself. But in reality its just another way of spending. After I decided on an acceptable amount I could spend on myself I thought I would easily meet the budget. Well I found it extremely difficult and its been a huge eye opener for me. Another area I have noticed I spend on is groceries, once again because it is for the "family" it has been back of mind. So now, although I am feeling quite confronted I know it is a good thing. We all work hard for our money, we should work equally hard in deciding where its spent. So now its my mission to cut back even further. I know I can do it!! My budgeting was always spot-on until I went from fortnightly wages to a monthly salary; several months have 5 weeks in them and it makes it very hard to avoid dipping into the overdraft to get through, and then I'm behind the 8 ball to start the next month. In theory I should be able to multiply my monthly salary by 12 and then divide by 52 to get my weekly allowance but then allowing for monthly direct debits becomes a nightmare and it goes in the Too Hard basket. I do use the envelopes in the drawer to set aside money for Christmas, car registration etc and find that works very well. Ideally I would love to get paid in cash but of course for understandable security reasons no-one will do that any more. It really bugs me because I despise the banks but having to get my pay sent to an account means you can't opt out. I've been talking with my man. I'm giving each other pocket moey as this is where we waste money. Thank you Rhonda for getting us all refocused. I've tried to this once and it was surprising how I saw on what I was spending my money and I made a great planning on where to use my money. Now I stopped but I will start again. Rhonda, I am a newbie reader of your blog, and thoroughly enjoying it, but this latest post really touched a raw nerve with me! I have been keeping a record of our expenses in a daily diary for many years, as we started out married life with a huge mortgage, which despite both of us working and having no kids, just never seemed to decrease. We felt like we were on a treadmill going nowhere, so I started writing down everything to the nearest cent. My husband was a heavy smoker in those days, and was shocked to be told at the end of one year his fags had taken $6000 out of our budget. OMG that could have come off the mortgage I yelled! 12 years ago he had a massive heart attack and was forced to quit smoking. Saved all that money on fags, but twice the amount was spent on medical expenses. We would still be in a huge financial mess if it wasn't for his dear Mum leaving us a substantial inheritance that has allowed us to finally pay off the house and do some much needed renovations. And at 70 years old, hubby was finally able to retire - YAAAY! But I still write down everything we spend to keep us on track in our retirement, as the money we have left won't last if it is wasted. My husband is a strict budgeter. Which is good as it has enabled us to own our home and be debt free in our early 40s. BUT it does drive me nuts when he asks me to dig out my pay slips from 3 years ago because he is out by 3 cents somewhere! Seriously! Lol I did say strict ( or obsessed).